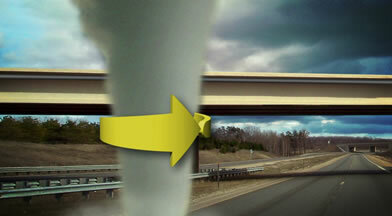 Many people mistakenly think that a highway overpass provides a safe haven from a tornado. The reality is that an overpass may be one of the worst places to seek shelter from a tornado. Using an overpass for your shelter can put you at a much greater risk of being killed or seriously injured by a tornado. Tornado wind speeds can sometimes exceed 200 mph. These destructive winds produce airborne debris that are blown into and channeled under the overpass where people might be seeking shelter. Varying debris, including dirt, sand and rocks that are moving at incredible speeds can easily penetrate clothing and skin, causing serious injuries or even death. If an overpass is directly in the path of a tornado, the wind could change direction by nearly 180 degrees as the vortex passes. By climbing up higher to get under the overpass, you will be exposed to higher wind speeds and more flying debris. Flying debris become dangerous missiles in the tornado airflow. Most overpasses don’t have girders or support beams for handholds. The narrow passage underneath an overpass could cause an increase in the wind speed under the bridge. Stay in your car with the seat belt on. Put your head down below the windows, covering your head with your hands and a blanket if possible. If you can get lower than the level of the roadway, exit your car and lie in that area, covering your head with your hands.